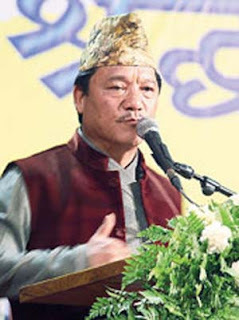 Bimal Gurung today hinted at starting a fresh agitation on Gorkhaland and said the elected GTA Sabha members and other party workers should be ready to go to jail on the statehood issue. The Gorkha Janmukti Morcha chief, while addressing a martyr's day function at Gorkha Rangamanch Bhavan, added that it was not right to accept injustice, while referring to the recent controversy over the hill leader not being allowed to address the crowd during the state government's Bhanu Jayanti celebrations on July 13. "This Shahid Diwas could be the turning point. In 1986, 1,200 people laid their lives and after 2007, too, others (seven) laid their lives. The number of martyrs might even increase to 1,000 now. I think we have started forgetting the sacrifice of the Gorkhaland martyrs, too preoccupied with the chair, but the time has come to remember the shahids," said Gurung. The Morcha chief today spoke about the pride of the community and said that it was not right to tolerate injustice. "It is not right to bear with injustice. They have taken over Bhanubhakta and they will probably also take over the Shahid Diwas. We have tolerated enough. Sometimes they come up (to the hills) and they kick us, sometimes they slap us. I am ready to take a bullet but will not sell my self-respect," he said. "By demanding Gorkhaland, we are only demanding our right, this place was never a part of Bengal.... Where is the issue of the division of Bengal," Gurung said. "They only see Kanchenjungha smiling, but they never see our people crying," Gurung said, without mentioning the state government or chief minister Mamata Banerjee. The Morcha leader also said that he expected the BJP government to look into the demand for Gorkhaland. "We want the Centre to understand our feelings. We are not demanding a separate country, we are only demanding a state, we are only demanding our rights," said Gurung. Sources in the Morcha said that a party delegation would soon leave for Delhi to meet the Prime Minister and other leaders to raise the issue of statehood. The Morcha leader said: "The Sabhasads and municipality councillors should also be ready now. If you are arrested during an agitation, you should go to jail smiling." Gurung also indirectly hit at those running development boards in the hills. "Our community is being divided but some of our people are selling their own community. Many are indulging in politics for personal gains and selling the future of their children," said Gurung.